If you’re looking for an affordable new way to impress your social circle and keep the party going strong, Eton’s Ruckus XL is an excellent choice. “Extra loud. Extra solar. Extra awesome.” That’s Eton’s banner for the Rukus XL solar-powered Bluetooth speaker (available at $200). It’s not exactly Shakespeare, but it gets the point across. This star-fueled stereo wasn’t designed to replace your hi-fi or make an elegant statement. But it was designed to be the ultimate backyard audio system, cutting the cords with an environmentally conscious blast of sound to illuminate even your rowdiest gathering. We recently spent some quality time with the Rukus XL to find out how it fares in the real world of beers, barbecue, and backyard games. Read on to see what we discovered. 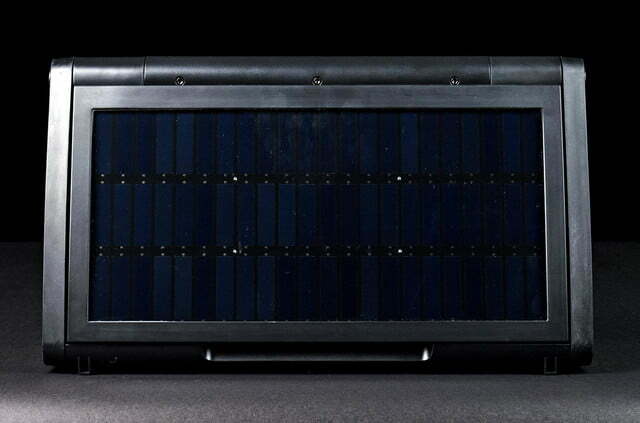 Opening the Rukus XL’s packaging revealed a dense black pyramid with silver screens along its front and a full panel of midnight blue solar cells along its back. Rubberized buttons line the top bar, and a plethora of speakers peak out from behind the mesh screens at the front and sides. As we pulled out the boombox, we were struck by how heavy it was for its size. Inside the box we also found a DC power adapter (for those grey days) and a packet of instructions and promotional material. Unlike many of the wireless devices we see these days, the Rukus XL doesn’t scream “chic urbanite sound solution!” Instead, it exudes an intentional aesthetic of utility and durability. 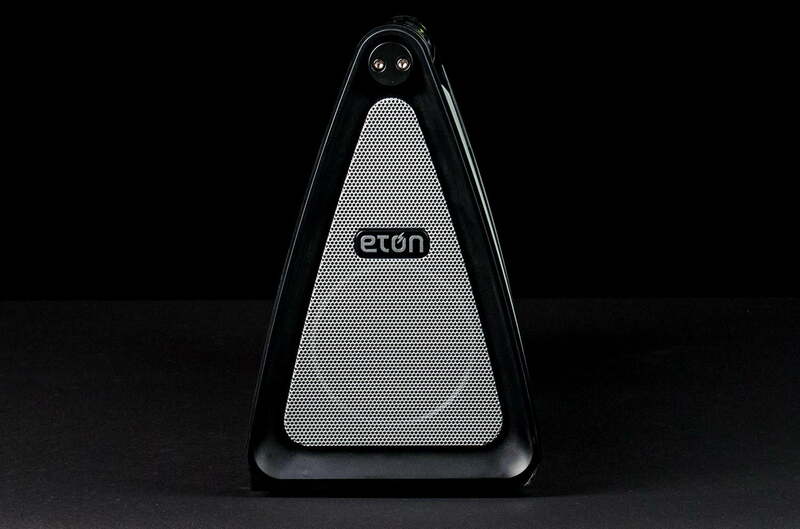 As we mentioned above, this thing is heavy, covered in a thick shell of plastic and plated with robust metallic speaker screens. 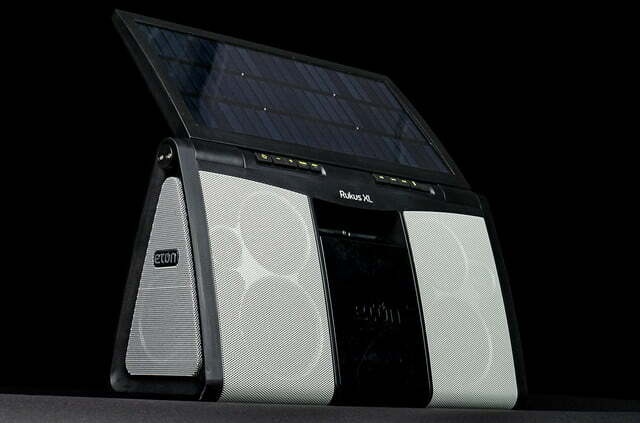 The solar panel that covers the speakers rear is substantial as well and swings on hinges, allowing you to adjust its angle for maximum sun exposure as the golden power supply that is the sun whirls across the sky above. Charging up a depleted battery in direct sunlight takes up to 5 hours, with progress indicated by a battery icon that sits along the top control panel. 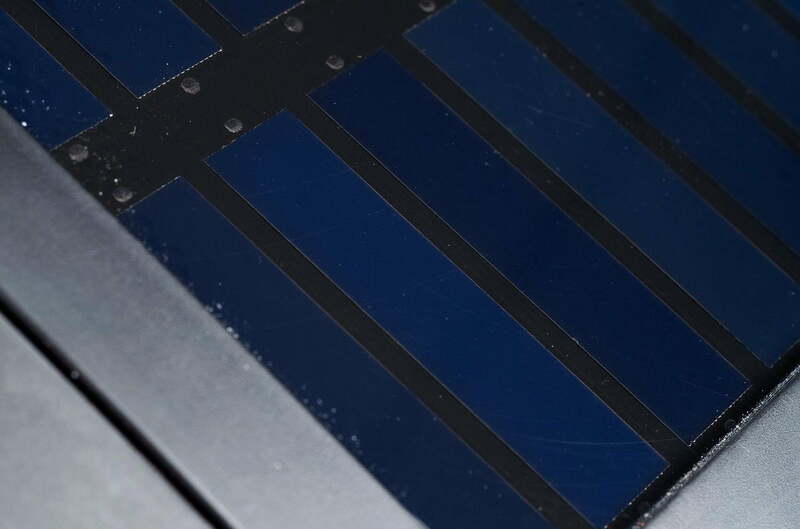 You can also charge the system the old fashioned way in about 2-3 hours, and the lithium-ion battery lasts for around 8 hours of total playtime with no assistance from the sun (or a power outlet). Basically, it was the hit of the party. 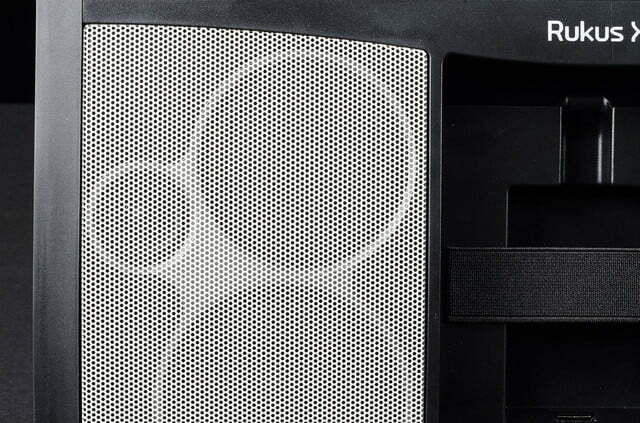 The top of the speaker bears a collection of rubberized buttons for onboard control, including power, song search, play/pause, volume, input selection and bass boost. There’s no need for a pairing button, as the system pairs automatically to a smartphone upon powering up. 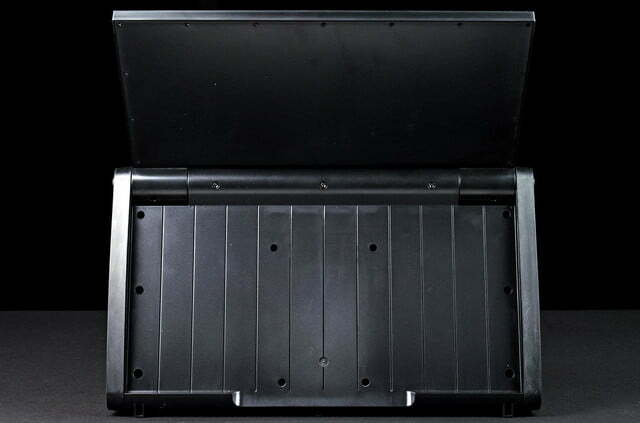 Along the front face is a glossy plastic door which folds down to reveal a strapped slot to secure your smartphone to the system, as well as a USB input for charging your phone while it plays. The XL’s impressive eight-pack of drivers includes two 1-inch tweeters, two 3-inch woofers, and 4 passive radiators. Two of the passive radiators rest inside the front face next to the main drivers, while another set sits at the bases of the side panels. Also on the right side panel is a small rubber stopper which covers the DC charging port, Aux input, and a “charge” switch to enable smartphone charging. 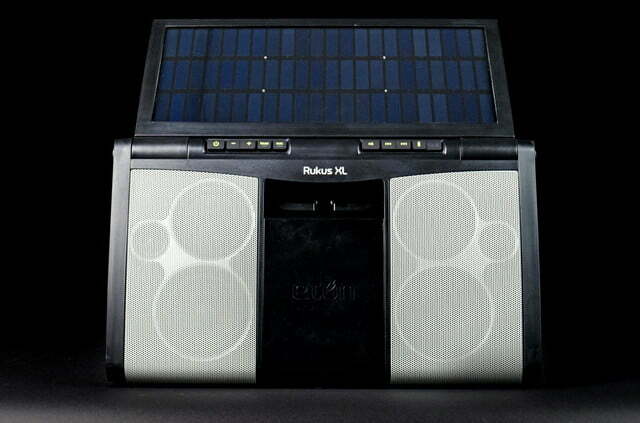 While we tested the Rukus XL at home, a more valuable evaluation came when we brought the system to a friend’s outdoor party, flipped up the solar panel, and let it rock. Not only did it do an excellent job of filling the yard with sound, it caught the eye of several visitors with its fusion-powered plate. In fact, we can’t remember a product garnering more attention. Multiple guests marvelled at its great sound and innovative solar-charging system. Basically, it was the hit of the party. 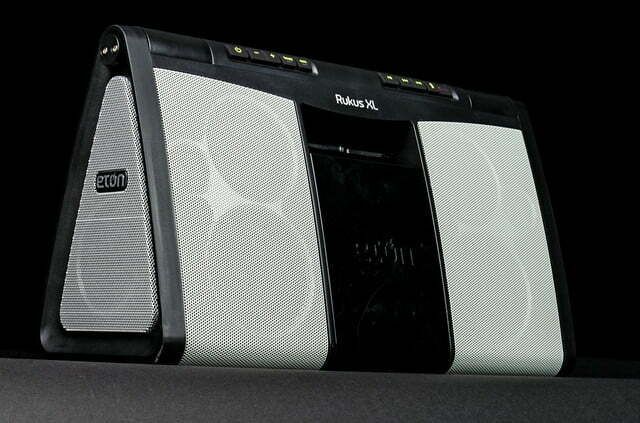 The Rukus XL’s utilitarian design serves as an apt metaphor for its sound signature. While it didn’t reach deep into the marrow of instruments, it belted out music with solid bone structure, raising the decibel level well above what we’d expected from a briefcase-sized stereo system. The midrange was a bit metallic and light for our taste indoors, but outdoors it was more effective, using its tight attack to cut through the air with excellent clarity. We also heard an impressive level of delicacy and clarity in the treble, bringing some brilliant definition to cymbals and upper register synth patches. 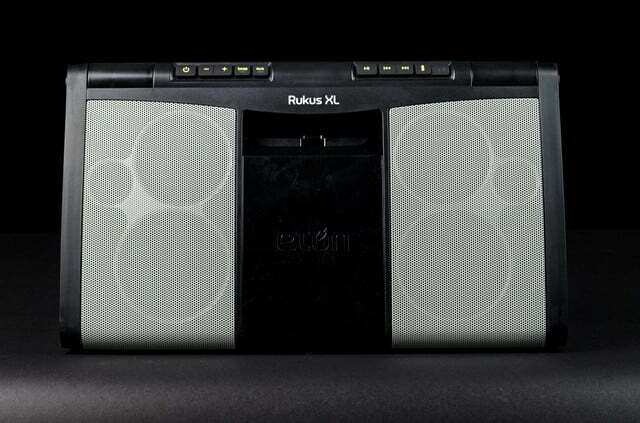 The Rukus XL’s utilitarian design serves as an apt metaphor for its sound signature. Our favorite tracks were often those with woody, organic instrumentation and plenty of movement in the percussion. We had a great time with one of our go-to test tracks, “Stay,” by Dave Matthews, which provides an almost incessant barrage of cymbal work that can tax a small system’s treble response. The Rukus XL handled the sterling shimmer of hi-hats and crash cymbals with ease, while displaying some vibrant color in the chaotic collage of instrumentation at the song’s climax. We were also impressed with Beck’s “Already Gone”, which was rendered with smooth, clean snare drums, smoky warmth in the vocal, and brilliant, forward cuts from the collection of acoustic guitars that bounce around the production. Head-on rock tracks were also a forte of the system, blasting tunes from Nirvana, Smashing Pumpkins and the Black Keys with bright, uncluttered force. We pushed the system to its limit to rise above the fray of clanging horseshoes and party chatter, and it had no trouble with distortion at all. A particular favorite was “You Are” by Pearl Jam, which gushed out of the speaker with powerful breadth. Eddie Vedder’s vocals were clear and present and we even heard some decent thump in the drummer’s toms as the XL flexed its 4 radiators. As might be expected, even with that four-pack of passive radiators in tow, low bass was a weak point for the system. Tracks like Peter Tosh’s “Brand New Second Hand” and Jay-Z’s “Hard Knock Life” had some decent bump in the lower mids, but we’d hoped for a bit more oomph in the bass, hearing a serious roll-off around the 150Hz zone. 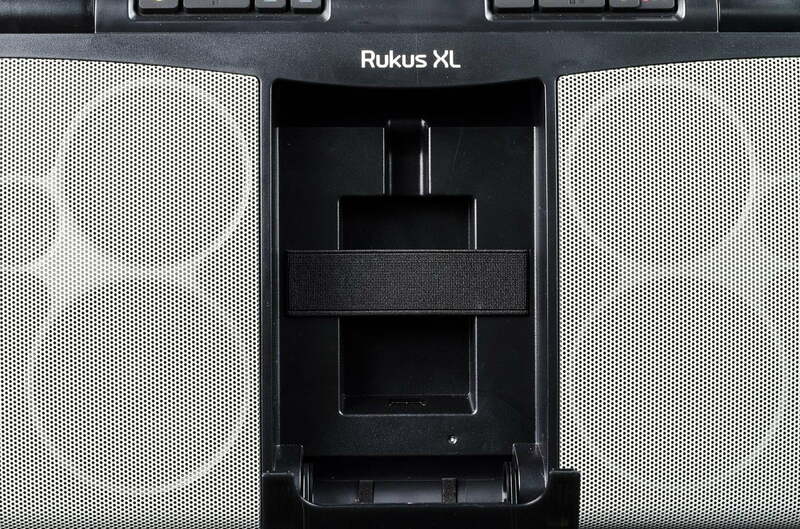 Still, though the Rukus XL may not bring the noise when it comes to hip-hop, the system punched out all of the genres we tested with more than enough force to keep the party happy. As strong as the Rukus XL is, it does come with a couple of weaknesses. For one, we wished for a stronger Bluetooth connection. It was nothing that would put us off the speaker, but things got spotty quickly if we got more than 15-20 feet away, and we had to keep our phone on a decent sight-line to avoid any blips. Other than that, the speaker worked perfectly, and as long as we stayed relatively close-by, we were able to keep our phone handy for song changes without incident. 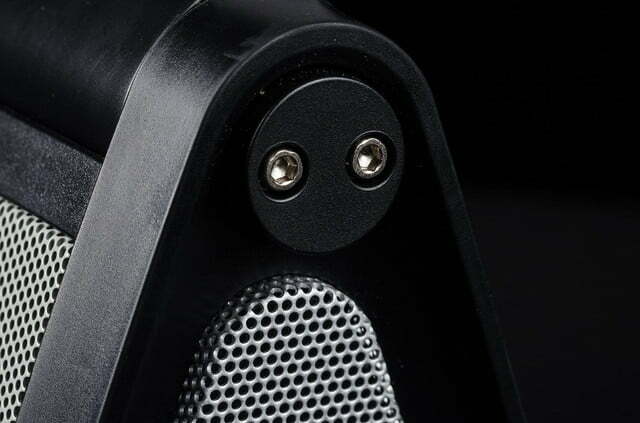 Also, storing a mobile phone in the speaker’s front slot is impractical. Not only is there no clear cord management system there, but if the sun is out in full force, a phone in that spot is going to overheat in no time at all. We had far better results by placing our phone in the shade of the speaker’s solar panel array, where the phone was able to stay much cooler, even on hot days. 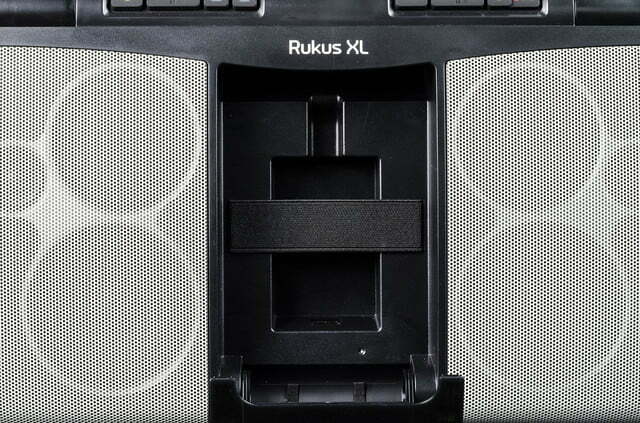 The Rukus XL’s innovative technology and powerful, balanced sound signature put it in a class all its own. While the speaker works well as a boombox indoors, its sun-powered endurance and capable driver set make it an almost indispensable sound source for the spontaneous backyard entertainer. If you’re looking for an affordable new way to impress your social circle and keep the party going strong, Eton’s Rukus XL is an excellent choice.